“Limited bandwidth”, or the express acknowledgement that the attention span of politicians is narrow, has become one of those overused catchphrases that always come out of the mouths of leaders, self-proclaimed experts, or journalists looking to excuse themselves for disregarding stories that are not repetitively featured in the media cycle. However, employing this hypocritical facade instead of exposing the truth about power, the media essentially acts as the catalyst for states’ overreach. When public opinion is left in the dark and unaware of the major abuses conducted either by the U.S. government or by some of America’s “close allies” around the world, the democratic rights to hold leaders to account are suspended. Thailand is one such story. The general, never a stranger to tongue-in-cheek remarks, said in May 2014 that he seized power to protect Thailand’s democracy and “for society to love and be at peace again”. After imposing martial law, the army backed his comments and insisted that their actions do not amount to a coup because they are actually “peacekeeping operations” to “restore order” until democratic elections are held. However, one year on, the US-backed junta shows no intention of stepping down, having postponed elections by six months until August of next year while intensifying its hold over Thailand. Ever since, hundreds of political opponents have been detained, media outlets have been banned, and political gatherings and protests outlawed, while those suspected of undermining the government are ordered to undergo “attitude-adjustment” sessions. Deposed Prime Minister Yingluck Shinawatra is on trial for a generous rice subsidy she used to secure the support of farmers, while her brother, former Prime Minister Thaksin Shinawatra, is being investigated for hinting in South Korean press that the 2014 coup was organized with the help of councilors of the king. As a result, he has been stripped of his passports and was slapped with a lese-majeste violation, facing up to 10 years in prison if found guilty. 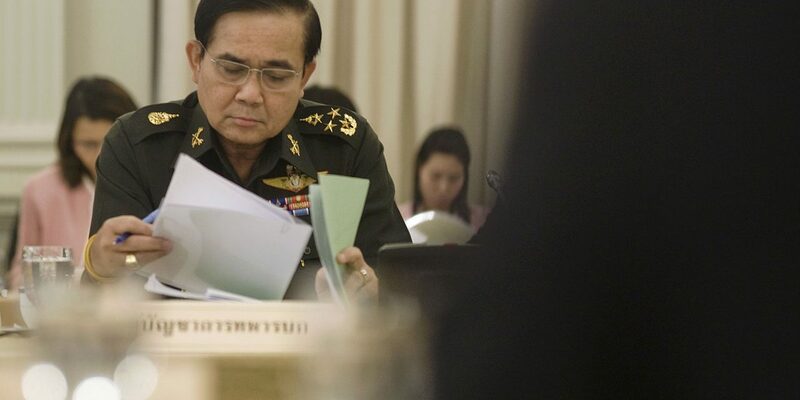 However, the strongest hint that Prayuth’s junta is looking to tighten its grip came in April when the draft constitution was released to the media. If passed by popular referendum, the project would set back Thailand’s democracy considerably. Employing some skillful creative lawmaking and language, the aim of the document is to reduce as much as possible the powers of elected politicians, in a bid to end what the Drafting Committee outrageously called “the parliamentary dictatorship”. Accordingly, half of the members of the Senate would be directly appointed by the government, while the individuals seeking to have their names on the ballot box would be vetted in advance by the army. Even after democratic elections are held, the generals would retain control over the legislative agenda through a 120-member National Reform Steering Committee, comprising members drawn from the current bodies entrusted by the military to govern the country. A National Moral Assembly would bar from office politicians “of bad character”, meaning “passing laws that ‘establish political popularity’ that could prove detrimental to national economic [interests] or the public in the long run”. The junta-appointed National Reform Council’s pre-election shenanigans and changes to democratic elements of the Constitution is said to be aimed at eliminating any potential political struggle and silencing former Prime Minister Thaksin Shinawatra. This time, Washington has coldly used the popular mood to its own advantage. When General Prayuth came to power, Secretary Kerry condemned the coup underlining that the takeover was completely unjustified and would “have negative implications for the US-Thai relationship”. However, after the initial media ruckus died down, things went back to business as usual. This year, Obama told Thailand’s new ambassador that he sees the country as a “partner and ally despite the differences over last year’s coup”. The State Department used similar wording in February, calling Bangkok “a valued friend and ally”. The European Union, for all its soft power, took a similar stance, issuing strongly worded statements last year before falling back to its usual aloof stance. Hiding behind the cynical trope of “limited bandwidth”, leaders on both sides of the Atlantic have been essentially condoning and silently supporting an illegal coup. This complete lack of interest from both Washington and Brussels has the unwanted effect of strengthening the legitimacy of the junta, who has so far been free to abuse a long-term political system and defang the people of Thailand. This lack of interest exposes once more the hypocrisy of the ‘democratic’ West, always ready for political grandstanding and moral posturing when its strategic interests call for it, but rarely ready to punish friendly authoritarian regimes.